If you’ve been checking the site with any regularity since 2012, you’ll be excited to see this, right? It’s a new post from everyone’s favorite blog about a guy who puts together a bunch of sets! Look, I’m not guaranteeing that Ill be posting new stuff here with any regularity, but since I logged in to update my 1979 Topps wantlist, I figured I could mention that I am still collecting. I just haven’t been very active in my endeavors. Looking back now I can see that I tried to collect too much. I quit once I came up with the idea to try and build every set released by Topps over the course of a year. I can’t imagine why I thought that would be smart. It’s like I was Veruca Salt and this blog became my chocolate factory. I wanted my golden goose, and down the garbage chute my enjoyment went. But I’m older now. Wiser. And maybe I can find the time to get back out there, check out the new landscape, and see if I can once again start whittling away at some of these lists. And share some more of my favorites. I make no promises as of now. But to be fair, it’s all you’ve had anyway since 2012. But if I can get the old scanner to work on the days that I don’t, maybe you’ll see some new activity around here. Blaster are still only $20, right? And once Aaron Judge proves to be a fluke I can get that 2017 Series 1 box I’ve been waiting on, too. So until then, the email still works. Call a buddy. Bring a friend. But only if they want to make some trades. Lest you think I’m a Gypsy Queen hater, I enjoyed last years GQ offering, so much so that I’ve got last year’s set listed on my wantlist as “inquire” because I need so much of it and have so little to offer. It was something of a sleeper hit in 2011, a release that no one bought early on, but once it hit shelves grew in popularity and become harder and harder to find at a reasonable price. I was somewhat hopeful that this year’s Gypsy Queen would draw me in again. I’ve reached wax saturation for base Topps and I’ve vowed not to keep buying packs of stuff I don’t need just to have something to open. That way when something is released that I actually want, I’ll have the excess cash to spend on it. 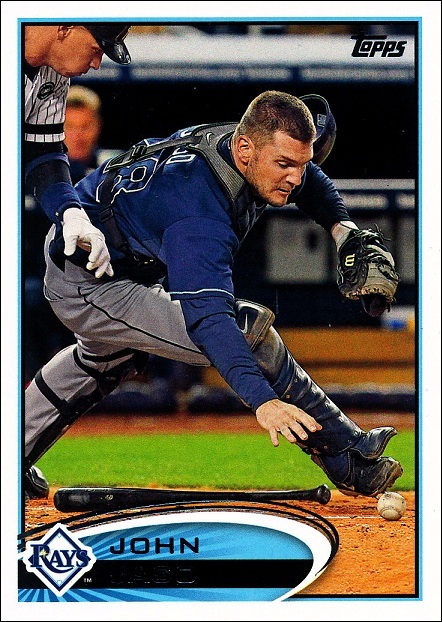 Anyhow, I liked the 2011 design, the inserts looked nice, the framed parallels were beautiful, and I was hoping that Topps would carry that forward into 2012. 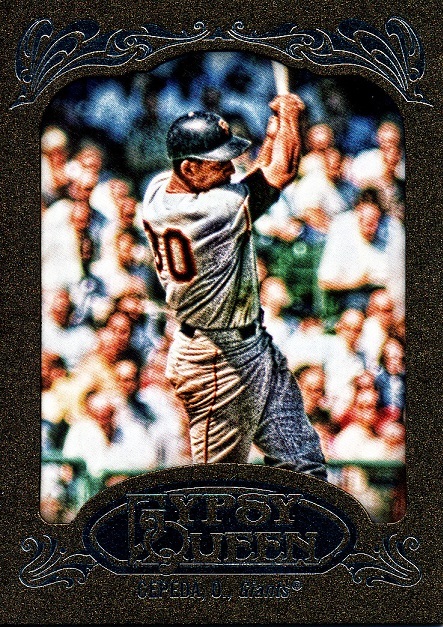 A secondary hope was that speculators this year would buy a lot early, causing Topps to ramp up production which would eventually lead to the price falling into more reasonable levels, or at least below the triple digits it stood at upon release. So when I went to the local box store for a family outing last weekend, I was a bit disappointed at the lack of GQ blasters. A closer look turned up a box of retail packs though and a three pack rack pack lying next to it. I grabbed a pack from the box and the rack pack as well, for a total of four packs, and, fingers crossed, ripped into ’em. Let me say right now that this set is as messed up as the Giants early season usage of Brandon Belt. Topps main concern here seems not with the player or making him identifiable, but rather making sure that you know this set is called Gypsy Queen. Look at that logo. It’s huge, and takes up 1/7 of the card. It’s definitely the eye catcher of the whole design, which is disappointing since I want my cards to be about the players and not the brand. While most of the modern player cards are disappointing, the legends I pulled actually looked pretty good. 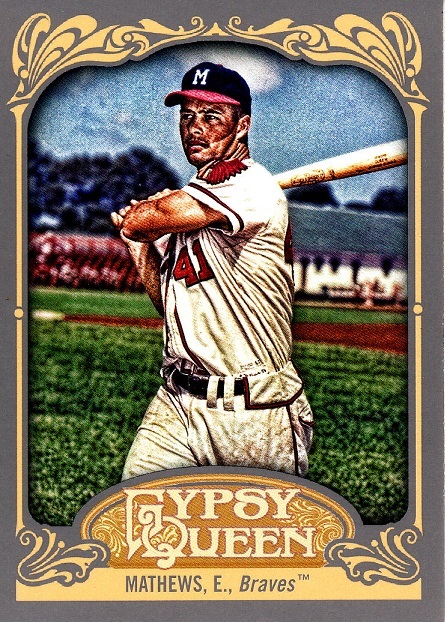 Eddie Mathews looks good on this card because he’s closer to the era it’s trying to represent. 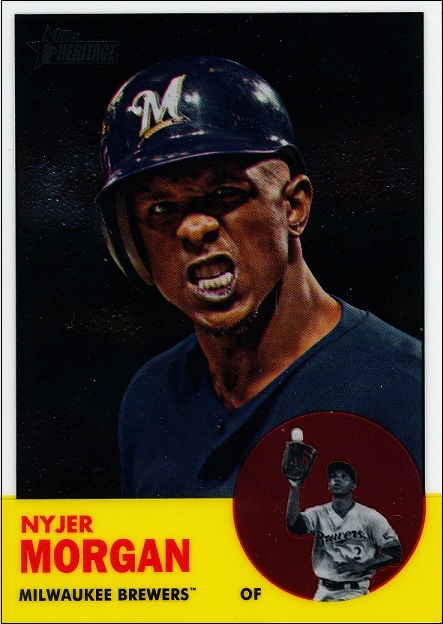 Whatever process Topps uses to “age” the images of modern players is awful, and they don’t seem to care all that much about improving it. It’s a let down every time. The older photos look much more natural, and I really like this card. I wouldn’t mind chasing down more of the “legends,” but I’m not sure the set completist in me would let me. I actually liked the inserts last year, and they went a long way towards making me want to build the whole set. This year? Meh. Again, the brand name is distracting, and this time it feels like it should be perforated so I can tear it off and enjoy the actual card. 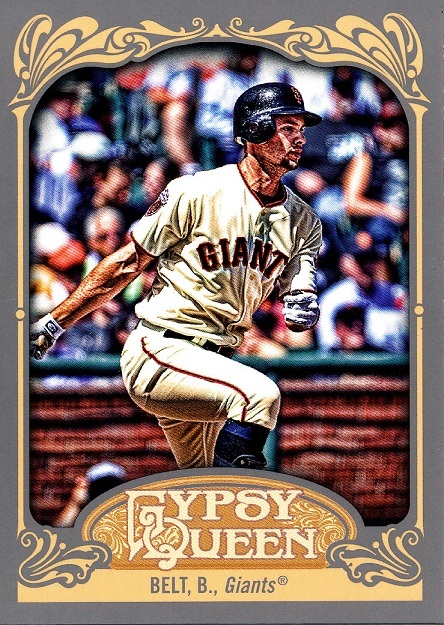 Without that logo it’s a much better design, but instead Topps seems intent on forcing the Gypsy Queen name on me anyway it can. It’s just an off-putting look. I will give them kudos for something on the back of these, though. The design is nothing to write home about reallybut I did enjoy the “Superstar Similarity” bit on the back. 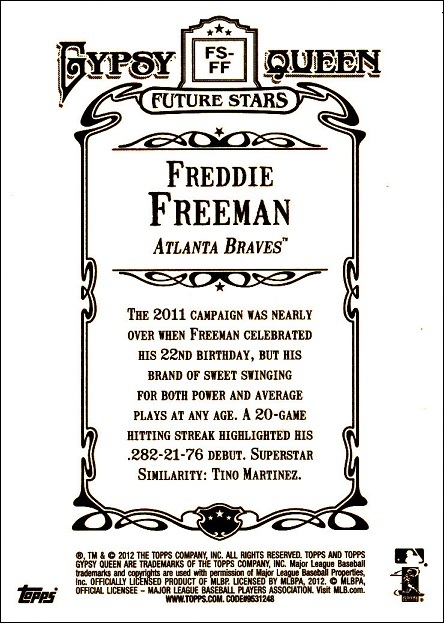 So Braves fans, if you were hoping that Freddie Freeman career path would mirror that of Tino Martinez, Topps thinks he’s your man. But is Tino Martinez really a superstar? If I put cards in binders, I’d put this set in backwards just so I could see this. Here’s the only thing that saves the Gypsy, in my opinion – the framed parallels. This is one of the three framed cards that come as a bonus in the rack pack, and, just like last year, they are awesome. Putting together a set like this is a long and active endeavor, and I’m not at the place where I can spend the time to track them down. Maybe one day if I find them in a dime box somewhere, I’ll plunk some money down. But until then, it’s going to have to wait. So, I guess for now I’m out on Gypsy Queen this year. More for you guys, I suppose. I really didn’t mean to be away from here for the last two and half weeks. In fact, when I started blogging again (or is it again again?) in February, I was hoping that I could post around three times a week – Monday, Wednesday, and Friday – with the weekend off to refresh and spend time with the kids. It wouldn’t be the everyday pace that I tried to keep when I first started this thing up, but I’ve got a family now and other obligations that need tending, too. I thought that three posts a week would be a big step up from the zero I had been averaging over the seven months prior, though, and armed with some thoughts, I was ready to roll. The odd thing is that I did manage to squeeze in the time to work out a few trades. You see, there are some sets that, when I see other bloggers are collecting them, get me to jump up and pull stuff right away for them. Almost all hockey sets qualify for this because hockey traders are so hard to find (but that’s another post. I’ll probably have the time for that one sometime in May). 1979 Topps is another. Why 1979 Topps, you may ask? Well, 1979 Topps is not a highly traded commodity, so I know how frustrating it can be to find cards to complete the set. In my own efforts to build this set, I’ve managed to build up a fair amount of duplicates in a variety of conditions, and it’s nice to be able to put them to good use. So when I saw the Troll was putting together this set I was more than happy to put together a package that was Florida bound. I wasn’t all that concerned about what I was getting in return. Now, Troll didn’t send the same number of cards that I managed to find for him. But if you trade with the Troll you know that he’s not going to short change you either. So when I opened the manilla that I had received, I was in awe seeing this one. Troll actually sent along five cards from the 1962 Topps set and one from my 1972 set to boot, but this Pinson is a thing of beauty. So now I’m back to his wantlists to try to find something more to make up for the difference. I see he’s posted another one of my trigger sets, 2007 Topps, so when I get done with this, I’ll have to start pulling again. But really no amount of 2007 Topps is going to equal this Pinson. Thanks to Thorzul, my Diamond Duos from series 2 is now complete. That leave series 1, and, when I finally get around to it, the Update set as well. Once those late Diamond Giveaway codes expire, I get the feeling that those boxes will drop. So until then I’ll wait, much like you do for my next post. Hey everybody! Look what’s on the shelves of your local box store! And check out what it says at the top? It’s 40% extra value! My own personal estimate was a measly 25% extra value, but when I saw the number was actually 40%, I couldn’t resist. I bought them all. Actually I bought just one. I did pretty well with these last year, and message board inhabitants swear by last year’s Topps series 2/Bowman Chrome mixes as being the key to all the big hits. So while I should be pulling cards for the Troll (sorry, man, it’s been a crazy week), instead I’ll be showing off what’s inside. Here’s the only new thing in the box, an “exclusive CHROME refractor” which must be part of that 40% extra value. 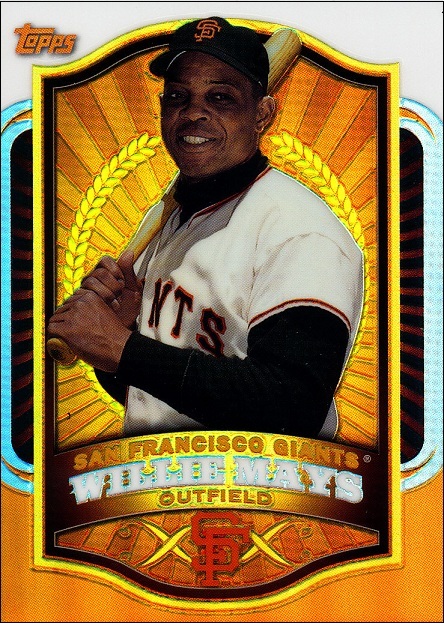 Willie Mays is joined in the three card set by Mickey Mantle and, somewhat jarringly, Ken Griffey Jr. The Kid’s inclusion makes sense, I suppose. 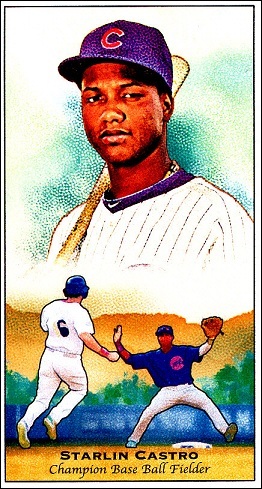 In light of Panini’s acquisition of the CMG contract, Griffey is arguably one of the top three retired hitters that Topps had left to include, especially since Bonds won’t allow this sort of thing. But it’s weird to see a modern era player in the mix with two legends of the game, especially one who’s end years were marred by injury and steep decline. I guess I don’t give Junior enough credit for his twelve years in Seattle. Here’s a card I’m sure you’ve seen somewhere, and it’s my least favorite of the bunch. And that’s saying something about a set I’m not fond of to begin with. But I really dislike this card. I’m sure it has something to do with my aversion to the Brewers to begin with and that whole Tony Plush thing puts me off, too. Perhaps Brewer fans find it endearing the way Reds fans took to Farney. Whatever the case, someone offer me something I’d like for this. Please. And the rest of the Heritage cards in the box looked a lot like this one, only without the weird look on his face and more cloudy backgrounds. Boring. I somehow defied the odds and pulled fourteen cards that I needed for my set from this thing, including this one of Ryan Roberts. I have no idea what’s happening to him in this picture. Is there a squirrel in the basepath that he’s trying to avoid? Is it a medical condition of some sort? Has an overzealous security guard tazed him instead of the streaker that is just out of frame? Whatever it is, it’s definitely an interesting moment to capture on cardboard. With my wife opening with me, it was no surprise when she pulled a hit. No quarter card, for sure. But a pleasant surprise nonetheless. 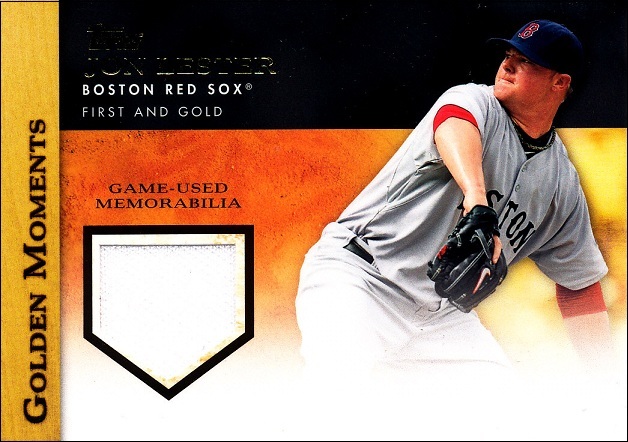 A white jersey swatch of Jon Lester. At 1:96, I’ve beaten the odds, which is always a treat. And if it were an off day for me, I’d probably celebrate with a ninth inning beer. Estimated % of value of for 2012 Topps stuff: one bucket of Popeye’s chicken with coworkers. I do enjoy these boxes, and I wish I had more affection for the Heritage brand to make them really worth my while. But I can’t financially justify buying more of these when more than half of it is useless to me, so this is more than likely the last of these for the season. No matter how much extra value they try and pack in. One thing that always amazes me in the speed in which some bloggers finish off the sets they collect. Already in the last month I’ve seen two or three posts about the completion of 2012 Topps Series 1 and one or two more regarding the completion of some of the insert sets as well. 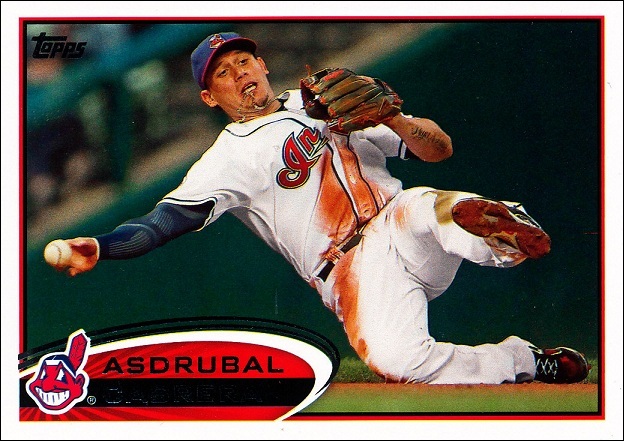 Meanwhile I’m still trying to track down the final three cards for my 2007 Topps set. Seriously. Go ahead and look. Click on the link above that says “Baseball wants 1980-now” (hint, nudge, plug). You’ll see that I’m also three cards from completing my 2009 set, two cards from completing the 2010 set, and about fifty cards short of declaring my 2011 set complete. And as of now I’m about eighty cards short of completing this years release. I’m sure some bloggers just have bought more cards than I have. And that’s fine. I will say that I’m not one to purchase singles to complete sets unless I’m getting a super good deal. $1 for a 1990 Score Ken Griffey Jr? No thanks. That’s like 1/7th the value of the set. I’ll just keep holding out for a trade instead. So when I see someone who has wantlists for sets that I collect, too, I’m eager to get a trade completed. So when I saw that $30 A Week Habit was collecting (I believe he’s since completed) the 2012 Topps set, I was quick to email him. Our trade was done in a matter of days. It’s one of my new favorites. Sorry J.P. Arencibia, but your place on the top ten list seemed tenuous at best. I’d slot Cabrera in at #5, and knock everyone else down accordingly. I’m sorry I don’t have the thousand words to devote to this one right now, but it is a pretty awesome shot that you don’t see very often on cardboard. And it’s perfectly oriented to boot. 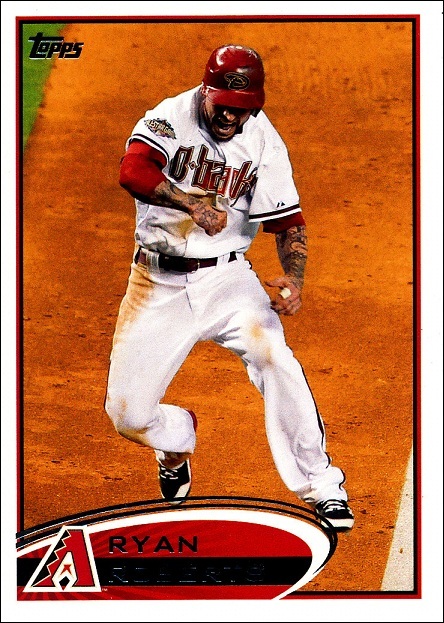 Unlike this disaster of a Chris Iannetta card. I realized while looking at this one that it’s the first time the phrase “worst card” popped into my mind. After almost two hundred cards, I take that as a sign of how good the photography in this set actually is. 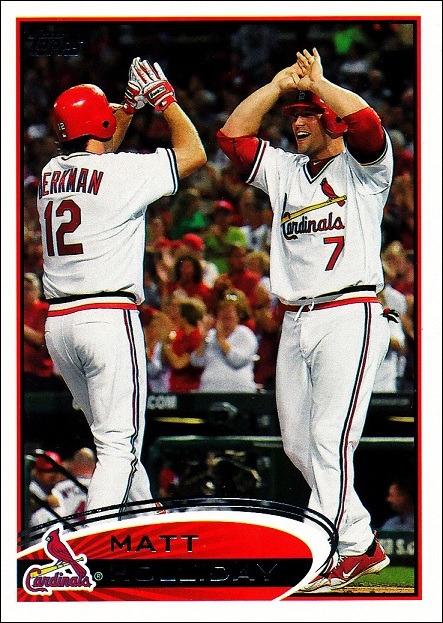 I’m telling you that years from now we will use the word “underrated” when talking about 2012 Topps. Either make this a horizontal card, use that airbrush to clear out that Phillie in the foreground, or find a new shot of Iannetta altogether. Bleah. 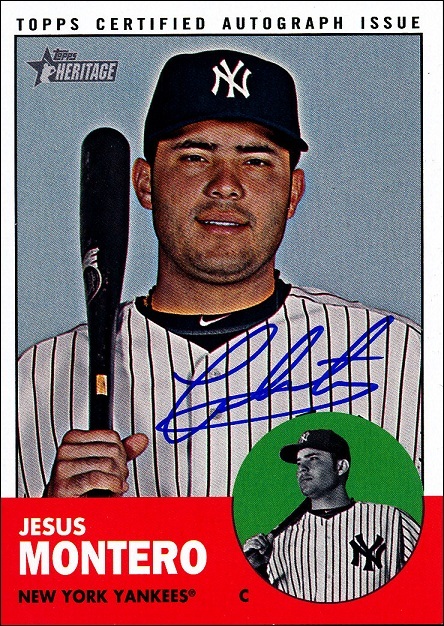 I’m not going to show any of the 2011 Topps he sent, because it was mostly standard baseball card shots that I needed. But I will show one of the handful of Kimball Champion minis he sent, because how awesome is Castro’s pose on the bottom of that one? I’m pretty sure that he’s in mid Kalinka there, which is part of the Cubs new strategy of winning through distraction. And should I note the irony of the guy who committed twenty-seven errors and sported a .950 fielding percentage in 2010 being called a “champion base ball fielder” in 2011? At some point I’ll have to add the Updates and Highlights portions of the Kimball set to my list as well, but I’m still not sure whether I’m going to collect the set as well, so that’s on hold for now. 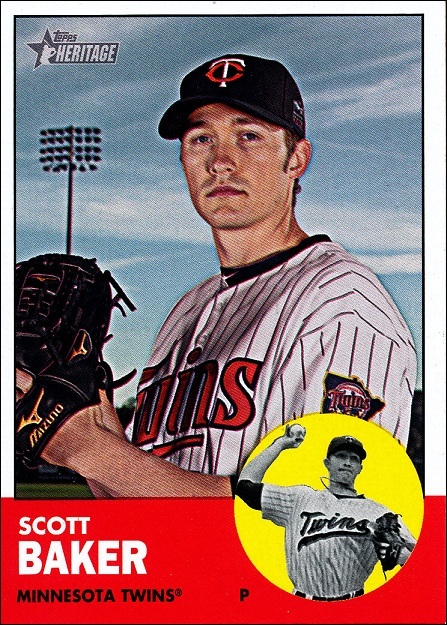 And if I see you are collecting the 2012 Topps set, I’ll probably be in touch with you as well. Or you can contact me now and then you won’t have to wait. I’m totally cool with that, too. I’ve never understood the hobby’s fascination with Topps Heritage. 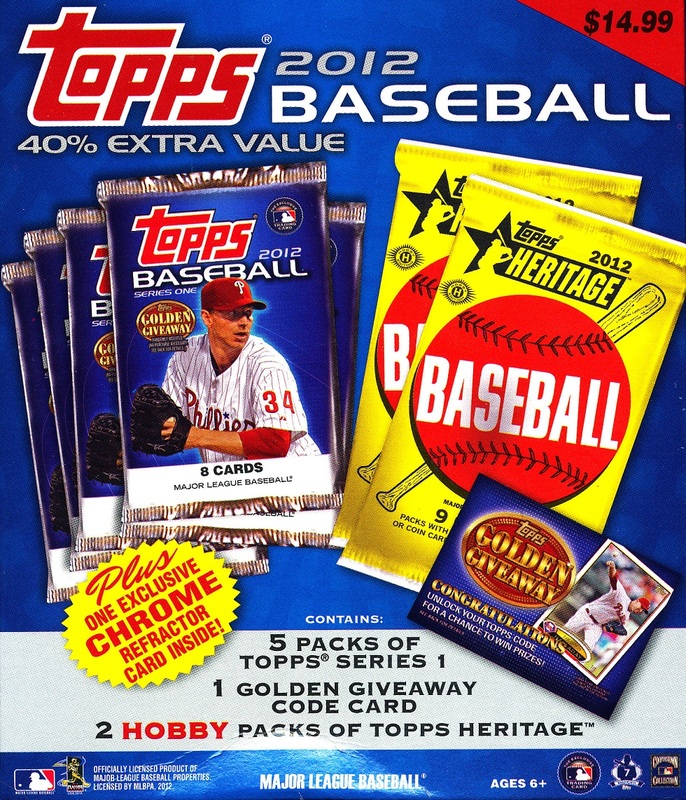 While much of the blogging and hobby world seems to swoon when the first of the Heritage packs hit retail shelves and hobby stores across the country, I grab a handful of packs or a blaster and wait for the greatness to wash over me. But it never does. 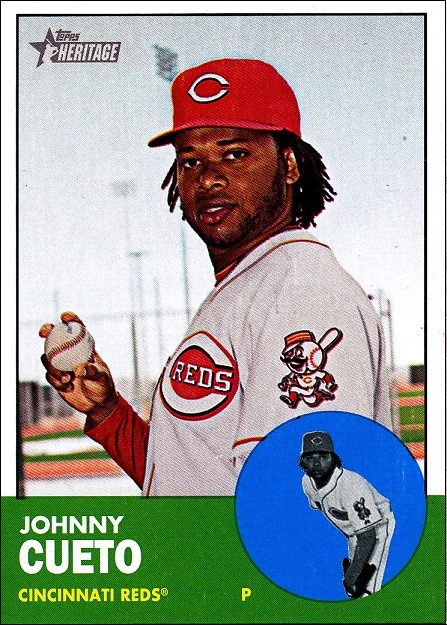 Look, there’s Johnny Cueto looking like Scott Baker, only without his glove hand in the picture. And these are almost dynamic compared with the portrait shots that dominate the set. I understand that this was what baseball cards looked like in 1963, but looking at these in person does not make me think Topps did a great job. Sure they did a nice job with the design, but they need to find a filter for those photos to make them feel more authentic instead of just washed out. I guess the problem could be me. Maybe I haven’t spent enough time truly appreciating the original design. I admit I don’t pull down my box of ’63 Topps very often these days since I’ve put most of the vintage sets on hold. 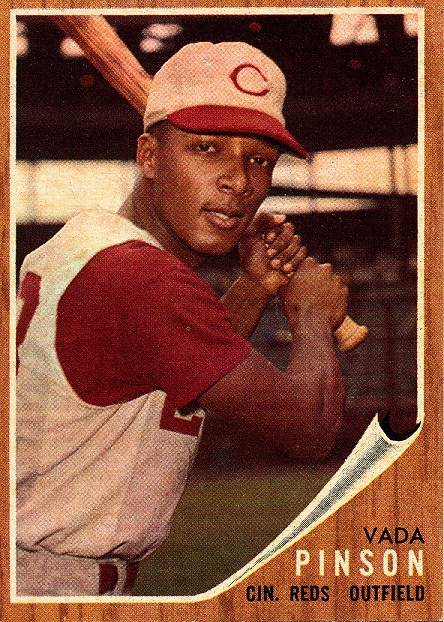 Perhaps I just can’t reconcile the image of a modern player on a card from fifty years ago. Or maybe I should have immersed myself in the culture of 1963 before opening the blaster that I bought. You know, fired up some Jimmy Gilmer and The Fireballs or Bobby Vinton on the hi-fi, watched some old Lassie or Patty Duke episodes on the old black and white, or cracked open a six-pack of Tab. Because what isn’t better with Tab? Case hits from a blaster are always awesome, especially when they are of a hot young rookie. 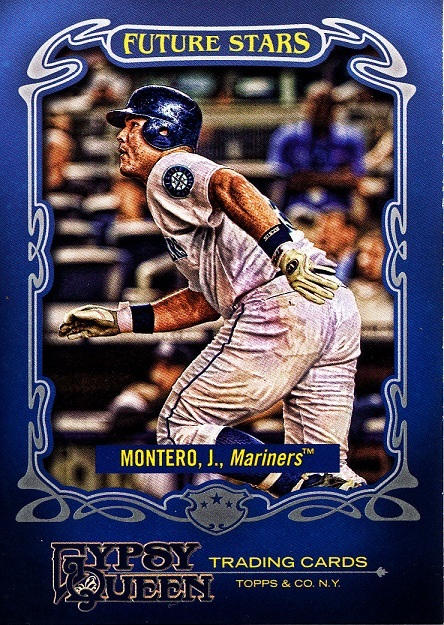 The only thing that would have made it better would have been if Montero was still in New York. It’s no longer in my possession, though. I’ve learned from reading message boards over the years that being one of the first to sell on eBay can improve your profit margin. So far, it seems like the right call. That leaves me with a number of base cards and a handful of inserts that I will be happy to trade away. Now, I haven’t given up hope for Heritage quite yet. I’m actually looking forward to Topps efforts to recreate those awkward action shots that began to appear in the 1972 and 1973 sets. If they can do that well, then maybe ten years from now I’ll be a full-fledged fan. Until then I’ll keep scratching my head. Why this card? I’m not sure what it is about this card that draws me. I’ve spent the last few hours staring at it off and on looking for inspiration, and while I like it every time I look at it, it’s hard for me to tell you why. I imagine plays like this are instinctual for catchers, though, ’cause Jaso’s up with the mask off and almost fielding the ball before Jeter (I think) is even out of the batter’s box. Do I have a bias? 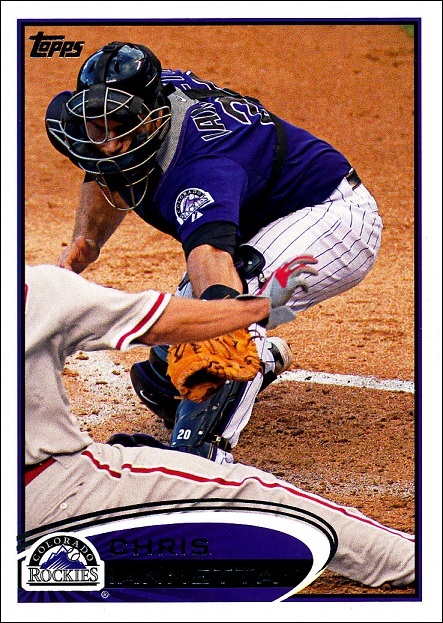 Apparently for catchers, since this is the third card that features one on the list. Why this card? I’m a sucker for mixed shading. When I was a kid I would stand at the top of our hill in sunlight and marvel at the fact that the bottom of the street would be shaded by clouds, and there’s some of that feeling here. Of course, this is an artificial shade and less inspiring than my youthful experiences, but it still brings me that memory. So don’t ruin it with your logic. That stupid white hat is doing enough ruining already. And how did I not mention the action? Do I have a bias? Against the Brewers, maybe. 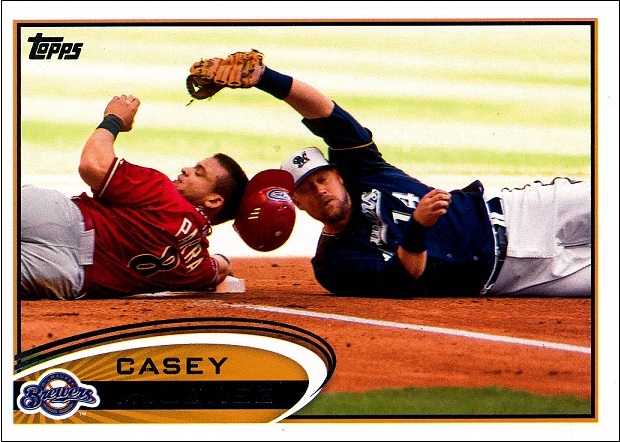 But McGehee’s not as obnoxious as some of his Brew-crew teammates, which may have led me to over look them and like this card more. Why this card? It’s a play at the plate! And he looks safe. 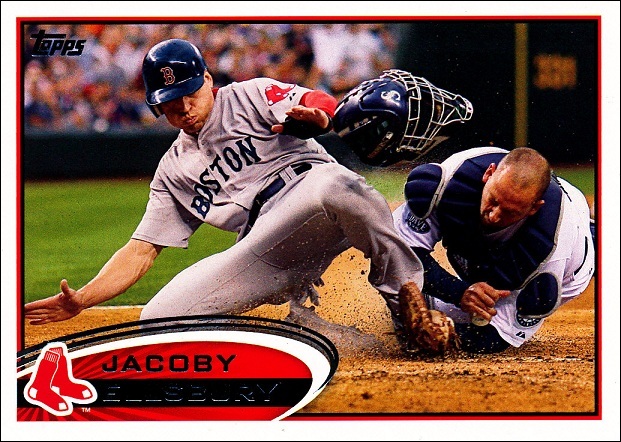 It’d be better if Ellsbury’s crotch weren’t the center of the card, or if you could see some eyeballs. On the flip side, that flying catcher’s mask is hard to ignore, and whoever the catcher is looks like he’s analyzing the line between plate and dirt very closely to see if Jacoby is scoring that run. Knowing how things went for the Red Sox last year, I’m changing my verdict to out. Do I have a bias? Nope. Why this card? I love the 80’s feel of this one. In a set filled with action shots, images like these tend to stand out a little more than usual, especially when the lighting belies another era when I was able to overlook the financial factors of the hobby and just enjoy the cards. Do I have a bias? Yes, against the Cardinals. I hate to say this, but they may have the best looking cards in the set this year. What 80′s set could this card fit in: This card was made for 1987 Topps Team Leaders subset. Why this card? What else could it be? Those of you who were thinking of me when you were opening your 2012 boxes (how sweet!) must have known when you saw this that it would be one of my favorites of the bunch. 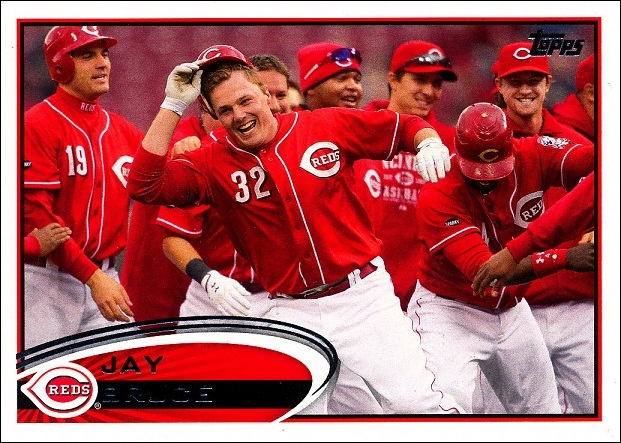 After all, Jay Bruce walk-offs are pretty sweet. Hopefully we’ll see a lot of these celebrations this year. Do I have a bias? Absolutely. What 80′s set could this card fit in: 1986 Fleer SuperStar Special subset. I’m interested in hearing your favorites in the comments below.